It may seem impossible to meet the flatness required by the Americans with Disabilities Act’s (ADA’s) less than two percent (1:50) maximum slopes for random traffic floors, landings, walkways, sidewalks, curb ramps, entrances, exit ways, ramps, and intersections at walkways.1 Fortunately, the new cross-slope for the 2010 edition is now less than 2.1 percent (1:48). Of course, this is still pretty tight, and it remains the maximum allowed finish placed continuous surface requirement. floor surfaces in restrooms, at drinking fountains, or other devices and dispensing components. The photo at left shows open site conditions and matching manhole covers placed as the same slope and elevation as the forms for the adjacent parking stall surface. The picture at right depicts the seamless-finish manhole covers within the concrete parking space that meets the Americans with Disabilities Act’s (ADA’s) < 2.1 percent in any direction at any point within the entire surface. 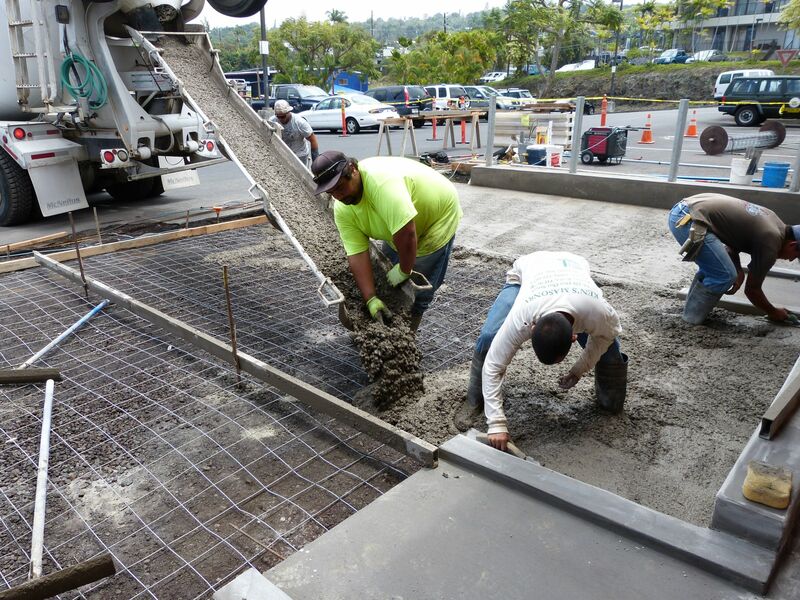 Before examining the specific steps to ensuring predictable concrete flatness, it is important to remember a few facets of the ADA requirement, along with some general tips and tactics. The maximum 2.1 percent slope is just that—a maximum. In other words, it is quite acceptable to, for example, design for one percent to improve the chance to succeed and meet the final placement requirement. This buffer compensates for materials and workmanship. One percent equals about 3.2 mm (1/8 in. ); since a penny is about 1.6 mm (1/16 in.) thick, it can be used to fine-tune adjustments. It is also critical to remember the slope maximum can be in either direction (i.e. +2.1 or ?2.1 percent), which equals 13 mm (½ in.) of total deflection, up and down. Of course, when positive drainage is needed, the final placed sloped surface is going to end up between 0.5 and 2.1 percent to meet ADA compliance. The buffer factor of one percent is used when setting up the initial grade layout, base course, forming, finishing, and final verification measurement not exceeding ADA compliance. The one percent will still yield positive slope when continuously set in one direction toward the end point(s) of drainage. 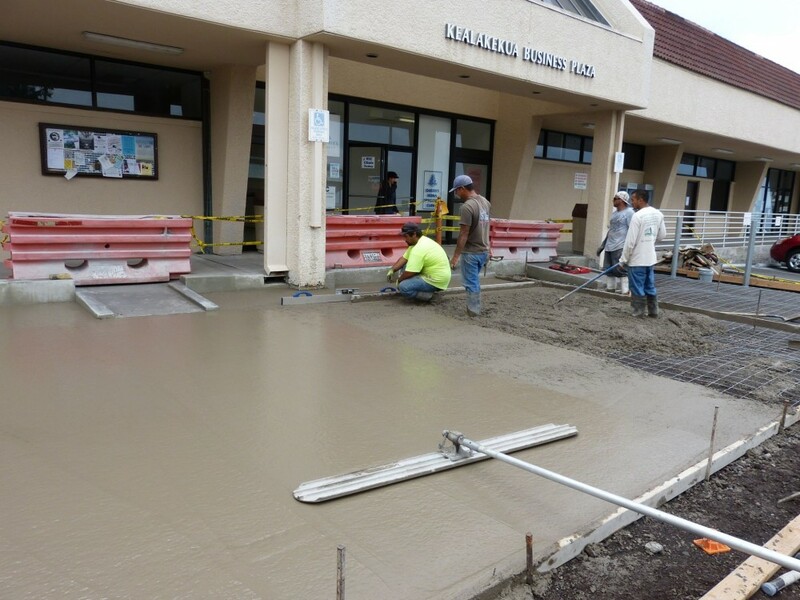 The final outcome of the degree of desired flatness can be controlled while the concrete surface is still plastic by using flatwork tools, screeds, and digital levels accepted in federal ADA court cases.4 A substantial investment in equipment and tools is not necessary. 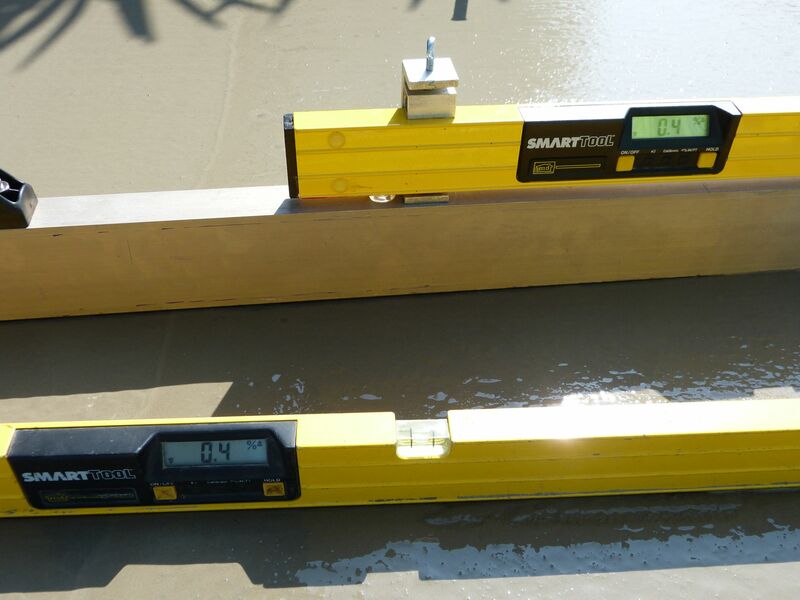 Relatively economical and reliable digital inclinometers have been routinely used for super-flat floors during placement of concrete surfaces; some devices are up to 0.1 degree accurate, and can have a historical reliability of more than 20 years in use.5They have liquid-filled sensors that are gravity-based, so the device will read the same when flipped 180 degrees, horizontally or vertically. Using these tools can help yield a predictably, repeatable flatter surface. In open-site conditions, the forms for the ramps’ ending elevation (which is what is being established using the mag beam and digital level) is accurately coordinated before the final finished < 2.1 percent parking surface is placed, allowing them to seamlessly match. Ensuring a predictably flat concrete floor does not require special admixtures or stiff slumps. 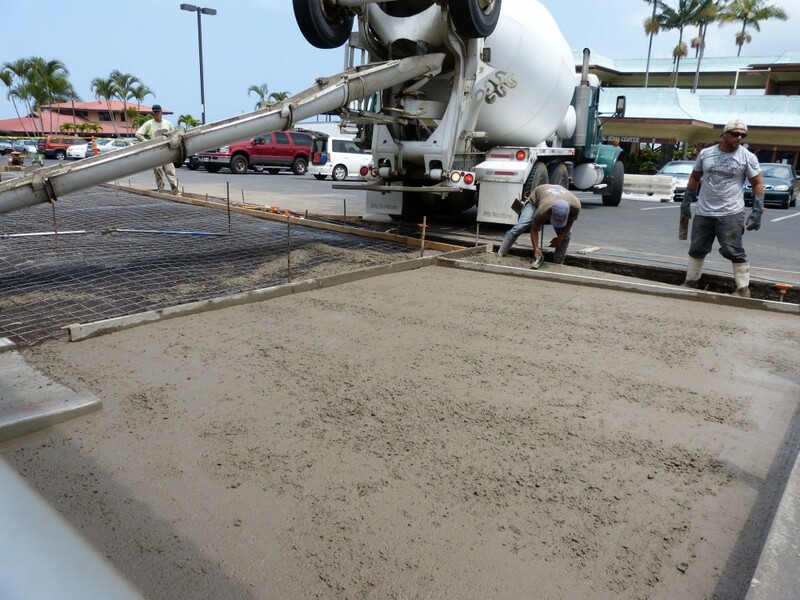 It is perfectly acceptable to use 2500- to 3500-psi (or other specified psi) concrete mix at 114-mm (4.5-in.) slump, but with aggregate rocks 19 mm (¾ in.) minus. Larger aggregate could lead to ‘tip ups’ that then require pressing the concrete surface down to work back the rock, deforming the surface. Similarly, one can use standard industry placement techniques with some minor, but consistently applied, ADA flatness tweaks. There are several steps to ensuring predictably flat concrete floors, and all projects will have their own specific challenges or constraints. Of course, the design should contain buffer factors that would allow the contractor some control to lower the slopes to make allowances for materials and workmanship.6 Some other considerations would be to have the sloped surfaces constructed as tilt-up walls, but under closely monitored flatness specifications. The problem is these methods would likely drive the costs up significantly, more than yielding to adding a buffer factor. Examples of placement in wide areas, showing how to separate the continuous concrete pour. 8.3 percent maximum slope for ramps no more than 9 m (30 ft) long or 762 mm (30 in.) vertical in height—the bottom and top ends of the ramp is required to have 1.5 m (5 ft) long < 2.1 percent landings. Both the < five percent and < 8.3 percent running slopes are required to maintain the < 2.1 percent cross slope (slopes perpendicular to the general direction of travel). Ramp and landing surfaces will need to be extended and lowered to accommodate the buffer factors necessary for materials and workmanship allowances. The layout, and grade or base, must be set at the buffered slope allowance. 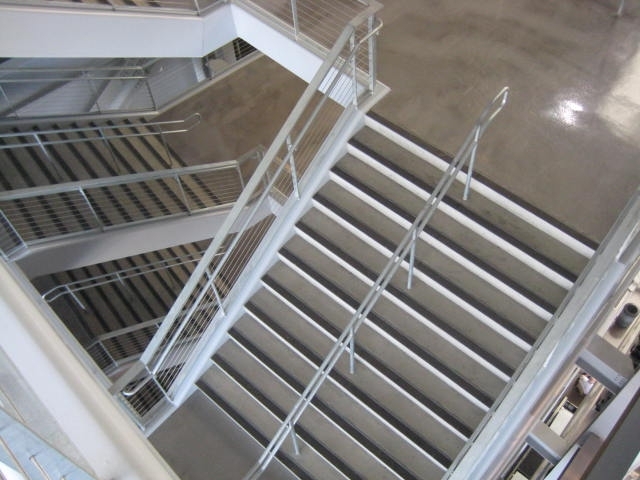 Covered indoor ADA floor surfaces are generally not required to have positive drain slope and can be set at zero percent; this gives the contractor the 2.1 percent buffer to meet ADA. However, slopes to required indoor floor drains (e.g. restrooms) will still need positive slopes. Those drains should be set at the center of the room to allow for positive four-way < 2.1 percent maximum slopes to the drain. As mentioned, a penny or two can be used to fine-tune the form-setting checks as they are equal to about 0.5 percent slope elevation. Forms or edge guides should be set at the buffered slope of one percent to meet ADA’s < 2.1 percent. The buffer factors can be applied to the two other ADA maximum slopes of five percent (buffer slope down to four percent) and 8.3 percent (buffered down to seven percent). Outcomes so far have been between 98 and 100 percent consistent compliant surfaces when checked on a continuous 457 or 610-mm (18 or 24-in.) grid. Forms should be examined with a digital level before proceeding. If someone disturbs the form, it should be double-checked and reset if necessary. 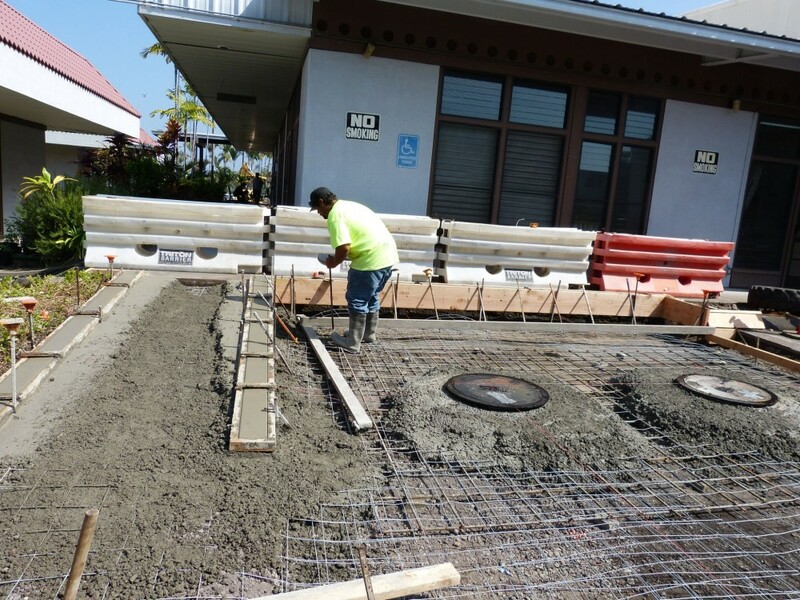 All forms should be re-checked just before concrete placement. If the placement area is wider than 3.1 or 3.7 m (10 or 12 ft), it is recommended to set up intermediate screed guides (on steel stakes with wire form hooks or clamps) with the buffered slope. 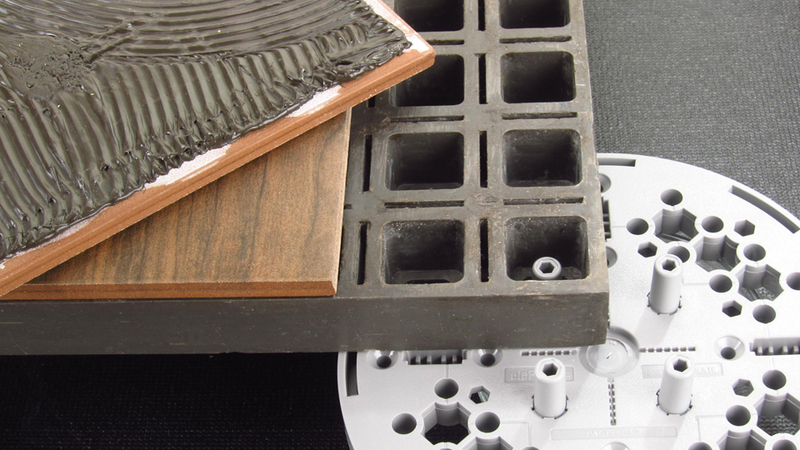 Limiting the width yields more control over the initial placement; the stake holes are small, easy to fill, and will not disturb the overall surface finish. Initial screeding: forms set to buffer factor slope of ± one percent. 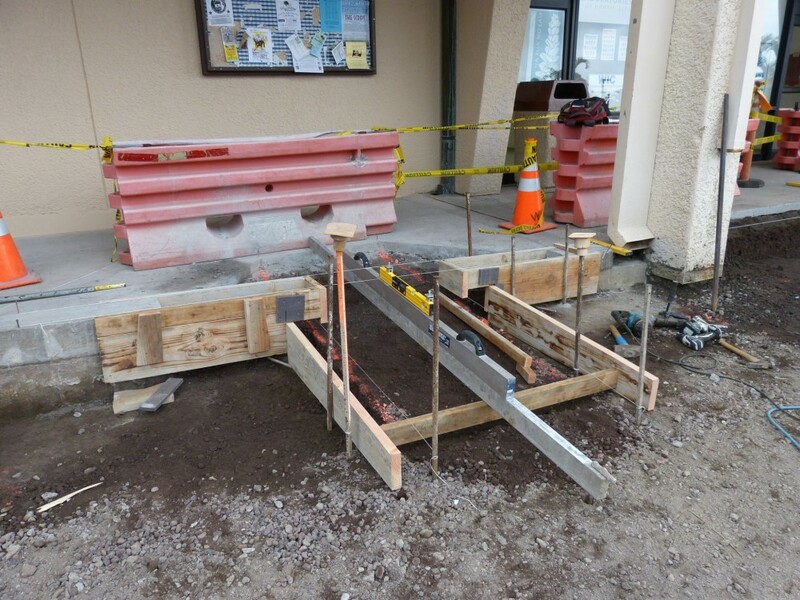 The mixed concrete should be placed against the end forms, working outward from them along with initial screeding, including pushing and patting concrete into the foot holes created by workers’ boots to ensure the rocks are replaced in the voids. Not filling the voids will cause small ‘bird-bath’ dips once the water has evaporated and concrete has cured because the rocks were displaced. The initial screeding should be done manually with a magnesium screed that meets ASTM B107/B107M-07, Standard Specification for Magnesium-Alloy Extruded Bars, Rods, Profiles, Tubes, and Wire, for acceptable straightness and twist tolerances. New select wood 2x4s have also performed well, and are easily cut to fit various screeding widths. 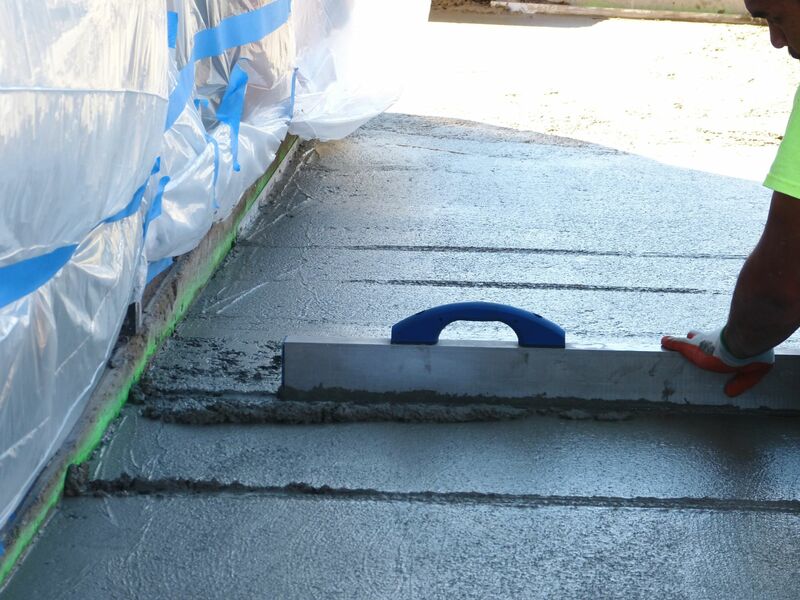 A 2×4 screed with the 100-mm (4-in.) face placed down on the concrete will provide the best flatness screed cut. Inclinometers and levels can be mounted on the screed to make it easier to check slope during this striking operation. 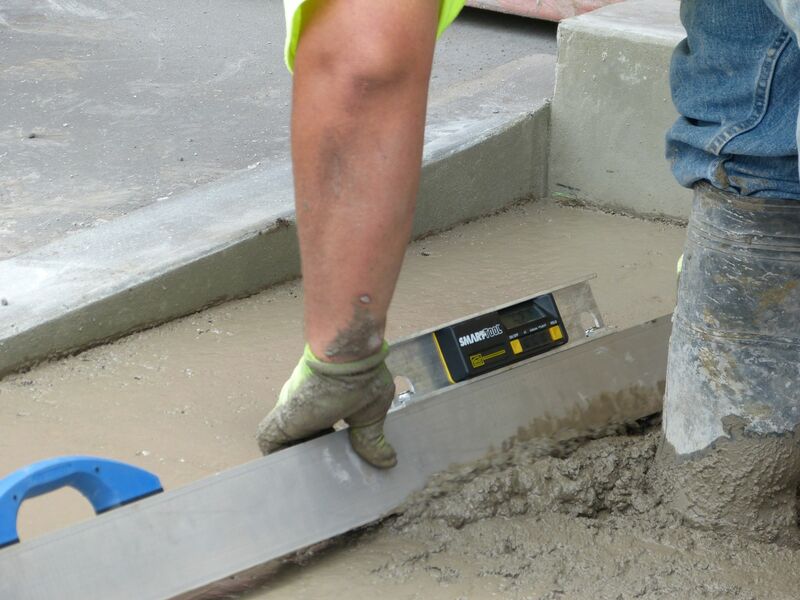 It is important the screed tool with level be frequently cleaned during the placement procedure to avoid having the concrete harden on the strike-off surfaces, and deforming the finish when used. 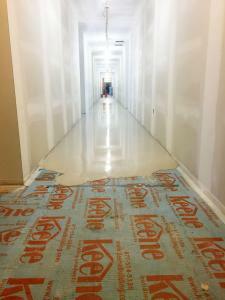 Initial screeding: second-phase bump-cutting using a digital level mounted on a mag beam screed. The consolidated surface should then be checked with a 1.8-m (6-ft) magnesium screed with a level mounted on it. It should be placed lightly on the firm, but still plastic, surface on a 0.9 x 0.9-m (3 x 3-ft) square grid pattern. Slope should be checked, along with a visual observation to confirm absence of valleys or humps. The former should be filled and the latter can have the 1.8-m check screed dredged into them until the level reads the correct slope. The dredge will look like a furrow, acting as a mark to gage the depth necessary for masons to cut and blend the surface. The square grid pattern check with the screed is essential to make corrections while the concrete is still plastic. For wide areas, ropes can be attached to the screed handles and lowered onto the surface in a grid pattern. A spotter mason should be closely following to make corrections as found. Initial screeding: third-phase bump-cutting dredging method to get cross-slope lower than 2.5 percent. The second pass re-float is to correct the slopes by filling valleys or cutting humps. Dredging the mag screed into the humps give the finisher a visual depth to cut and float to. It is best not to float beyond making corrections and final consolidation blending. It is important not to overwork the concrete surface to avoid creating more deformations in the surface. 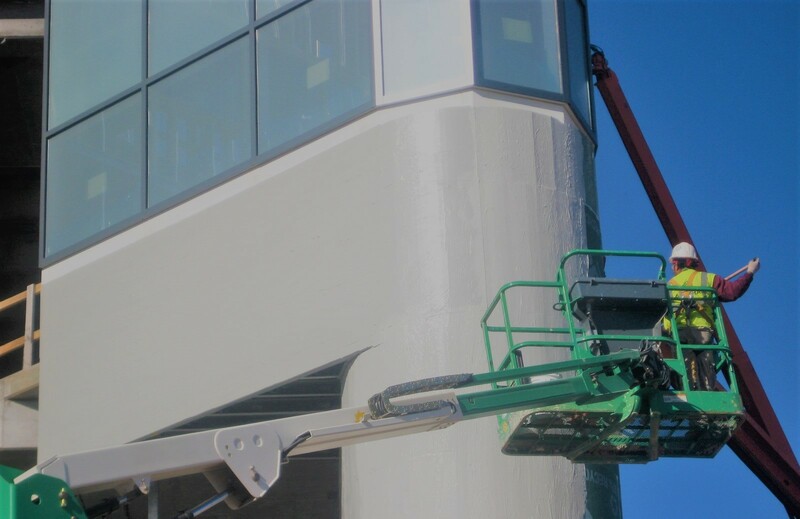 It is highly recommended the contractor or owner retain one person who has knowledge of ADA and construction placement of surfaces to be responsible while working with the crew to check and verify each sequence of steps have been completed for Steps one through 11. This person should have the correct digital levels (field-calibrated before use), including at least one mounted on a 1.8-m (6-ft) long 51 x 102-mm (2 x 4-in.) magnesium beam to preform the various levels of checks. The 0.6-m (2-ft) long level should have 19-mm (¾-in.) square engineered poly feet set 76 mm (3 in.) 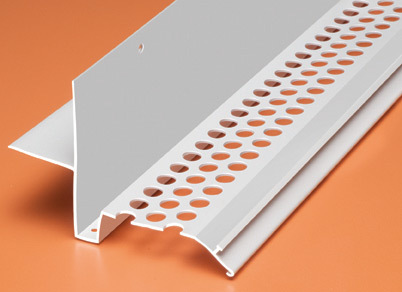 in from each end, mounted on the rail side of the level that touches the form or finished surface. This way, it takes samples at 457 mm (18 in.) without rocking on small particles on the surface off the forms or other surfaces. The 300-mm (1-ft) walking profiler already has factory installed and calibrated articulating feet for preforming form checks and final, placed finished checks. A manual showing how the continuous measurements are made is available from the manufacturer. Demonstrating the reliability between a level directly on the concrete and mounted on the mag beam (a), a walking 300-mm (12-in.) profiler on articulating feet (b), and a walking profiler used on a mag screed to check the first cut. At this point, the surface can be broomed and allowed to cure. The final cured surface should meet the slope, stability, and slip resistance required for ADA. This requires walking surfaces to be stable and firm (i.e. and not delaminate like loose gravel or slippery carpet runners, or be spongy like a thick carpet with thick sponge pad or soft mud or grass). First-pass consolidation (i.e. float) of surface after screeding but before checking the surface with a digital level mag screed. The success rate of the buffer factors, and the results of 14 years of placement of various cladded floor finishes (e.g. ceramic tile, wood, or vinyl) concrete, asphalt, and raised wood decking with flatness techniques, shows the combination of strategies in this article can yield predictable, reliable surfaces, compliant with the Americans with Disabilities Act. Jean Tessmer, RME, ASID, is part of the barrier-free design firm, Space Options. 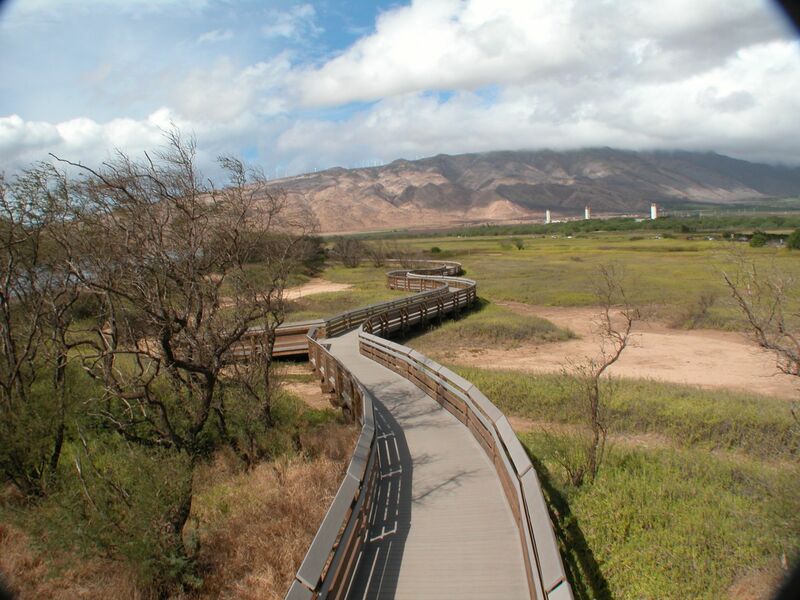 She is a federally qualified barrier consultant, and also holds licenses as a Master Plumber and Landscape Contractor in the State of Hawaii. Tessmer has 26 years of experience integrating ergonomically functional, environmentally accessible commercial and residential facilities. She participates in public hearings and comments on the development of the new 2010 Americans with Disabilities Act (ADA), ANSI A117.1, California Title 24 Access Code, and the Hawaii State Building Code Council. Tessmer provides training for contractors and ADA education for designers. She can be reached at design@spaceoptions.com.